Description: Scarce Beacon Library edition of Ainsworth's romantic novel set in the 16th century. Blue cloth boards with black text on spine. Minor stain on rear cover. Upper corners and head of spine bumped; lower straight. Pages are in good condition for their age, though several have been dog-eared where the previous owner didn't have a bookmark handy to keep their place! Front endpapers, half-title, and last few pages are foxed. rfep has some pencil marks. Half-title and frontis slightly damaged at foot (refer to image). Otherwise all pages are unmarked, and have even appeared to resist tanning! Super-tight binding. 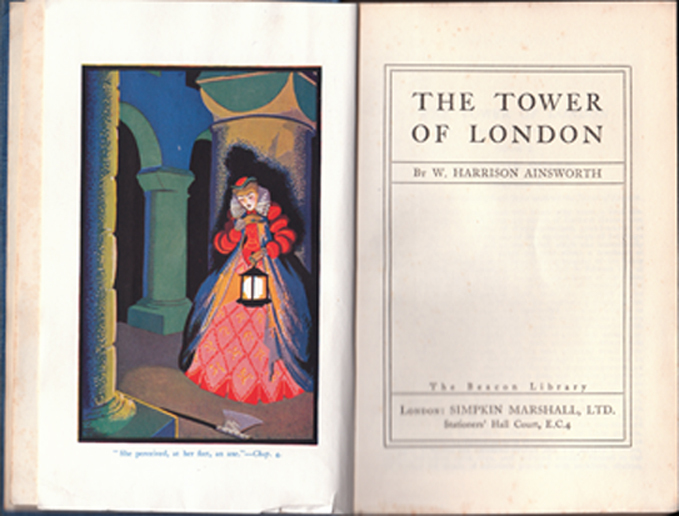 No year of publication given, but assumed to date from c.1920. Measures 19 cm × 12.5 cm (7.6″ × 5″). Large 12mo. 371 pp.